I have given you abundant life in Me, says the LORD. 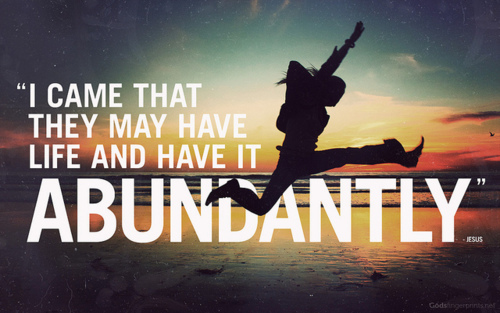 It is abundant NOW, not some day. I have given you abundant grace! I AM more than enough for you. You will not just get by with My grace and life in you, but you will have above what you need. I will give you even more as you open yourself up to Me. For you will be empowered to the work productively in My kingdom for My purpose and My glory that is eternal. Look at what you are now and what I have already done in you and for you and through you. It is My power that I have invested in you that will increase. It is you that I will expand. I will use you in a new way with a fresh fire in you and My manifest glory will be seen on you, says the LORD. Look to Me for LIFE that is powerful, says the LORD. For what I have for you will bring you up higher, broaden you and cause you to bear much fruit. I Am the source of all life and I have given you much grace. Receive MORE from Me. Open up your mouth and I will fill you with good things. I will feed you with the fresh bread of My presence and you will grow in stature. I will give you new wine that will make your heart glad. I will cause you to be joyful and you will excel in the things of My kingdom and rejoice in the new that I have for you, says the LORD. Thank you lord 4 your abundance love and blessing. Amen. Yes, we need to give thanks to the Lord for everything now. Amen, fully open to You Lord. Amen.. Thank you so much father ! Your great name be glorified ! I receive it. Thank you Father. Amen!